The Woods is a perfume for men. A fragrance, which serenades a stylish masculinity of the urban gentleman. The Woods is a complex perfume, which was developed by the Parisian perfumer Mark Buxton. Elegant, but woody – with aromas of mandarin, nutmeg, absinthe, myrrh, amber and musk, it spreads a hypnotic fresh, spicy-floral scent. 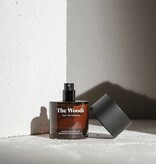 The Woods is a perfume that never stops evolving while wearing, creating a unique scent on every man’s skin. A “non perfume” which doesn’t capture its user in a cloud of essences, but instead surrounds him with an almost magical aura.